You’ve learnt how to start sailing, now find out how to stop, using the Hove To Technique. Hove to is another way of stopping, which is preferred to Lying To, because it is more stable. Hove to is accomplished by the counteracting forces of the action of the rudder and some of the mainsail, and the drive of the jib. When coming out of a tack, leave the jib backed. Push the tiller firmly to leeward (i.e. away from you) and leave it there. Ease the mainsail out, until it starts to flap, at which point there will only be a little power left in it; this is enough to counteract the force from the jib. Basically, the jib in a backed position tries to push the bow away from the wind (see article on Rudderless Sailing), but as the boat starts moving forward, the rudder comes into play, and counteracts, turning the bow back up to windward. The mainsail merely maintains boat balance, while the see-sawing of the jib and rudder keep the boat in place, although there will be some leeway drift backwards. To avoid excessive heeling that the mainsail can't cope with, raise the centreboard about one third so only two thirds is in play. Note that the boat does not move sideways as much as in the diagram above - it is just for purposes of the diagram. To move away from hove to, simply uncleat the jib and unback it, pull in the mainsail, pull the tiller towards you, and sail off. 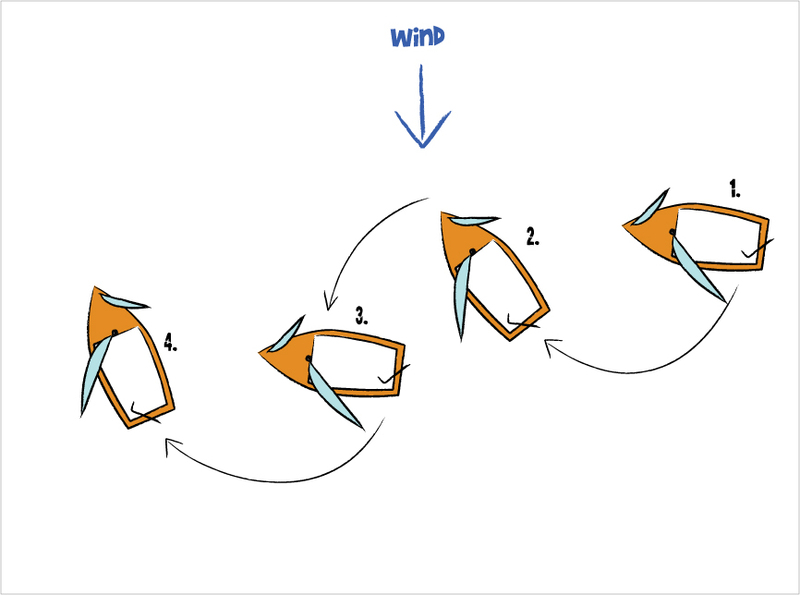 This technique is not only used for dinghies but also for cruisers and yachts.